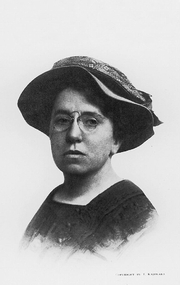 Emma Goldman was one of the most famous anarchists and political activists of the early 20th century. She campaigned on behalf of many social issues and her lectures attracted huges crowds. "I want freedom, the right to self-expression, everybody's right to beautiful, radiant things," she said. Emma Goldman dedicated her life to the struggle against inequality, repression and exploitation around the world. Emma Goldman is currently considered a "single author." If one or more works are by a distinct, homonymous authors, go ahead and split the author. Emma Goldman is composed of 6 names. You can examine and separate out names.